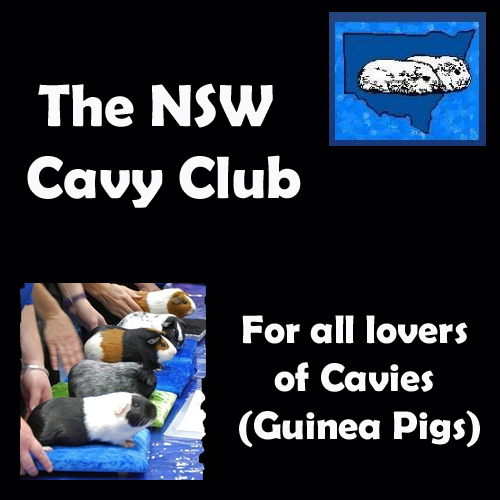 The NSW Cavy Club for all lovers of cavies (guinea pigs) whether breeders, exhibitors or pet owners. The club is open to anyone who loves cavies. You don't have to breed and show. Pets are welcome and there are classes for them, too, at some shows. The aims of The NSW Cavy Club are : to upgrade the status of cavies; to breed good quality cavies to Australian National Cavy Council standards; to provide information to the public on the care and special nature of cavies. The Club holds regular shows throughout the year, usually either at Castle Hill Showground or Pymble Town Hall, plus the Koi Carp & Pet Show at Fairfield Showground and occasionally at other venues in the Sydney area. It also publishes a newsletter 10 times a year, a basic cavy care booklet and information sheets. Please see our website and facebook page for more information.